Cookies make the perfect gift for boys! These cookies were ordered by a girl I know who was apart from her son on his birthday. She wanted him to know she was thinking of him and had me send these over. 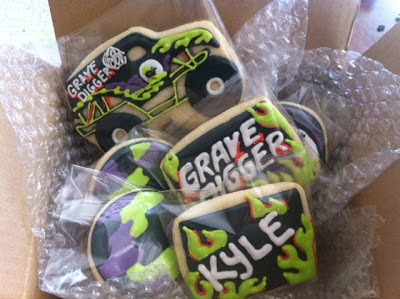 These were definitely out of my comfort zone as I have never actually seen 'Grave Digger.' Thank goodness for internet research!